During the 60s and 70s, computers substantially changed many industries. But it wasn't until we hooked them up, en-masse, into the global internet that they were able to change the world. That's why researchers around the globe are already working on the building blocks that will hook up the world's quantum computers - which are still very rudimentary - into a similar global network. "The effort to build a quantum computer is often described as the 'space race of the 21st century', but today's computers didn't realise their full potential until we had the internet," said Matthew Sellars, Program Manager in the Centre for Quantum Computation and Communication Technology at the Australian National University. Sellars leads a team that has developed a telecom-compatible quantum memory unit - a crucial component for such a network. The team, which has been working on the project for a decade, showed that they could dramatically improve the storage time of quantum memory using the crystal. 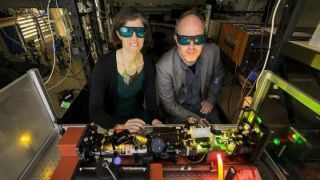 "A telecom-compatible quantum memory is a vital component for a practical quantum internet," said Rose Ahlefeldt, who also worked on the project. The chief advantage of their design, which was detailed in a paper in the journal Nature Physics, is that it operates in the same band as regular telecoms networks. That means that it's compatible with existing fibre optic infrastructure. It's also compatible with many different kinds of quantum computer. "This result is so exciting to me because it allows us to take a lot of the in-principle work we've demonstrated and turn it into practical devices for a full-scale quantum internet," said Sellars.